“The Greatest Two Minutes in Sports™” is right around the corner already, and you know what that means…. party time! For the past few years, HWTM has partnered with 14 Hands Winery (a proud sponsor of the Kentucky Derby® for the 2nd time this year!) 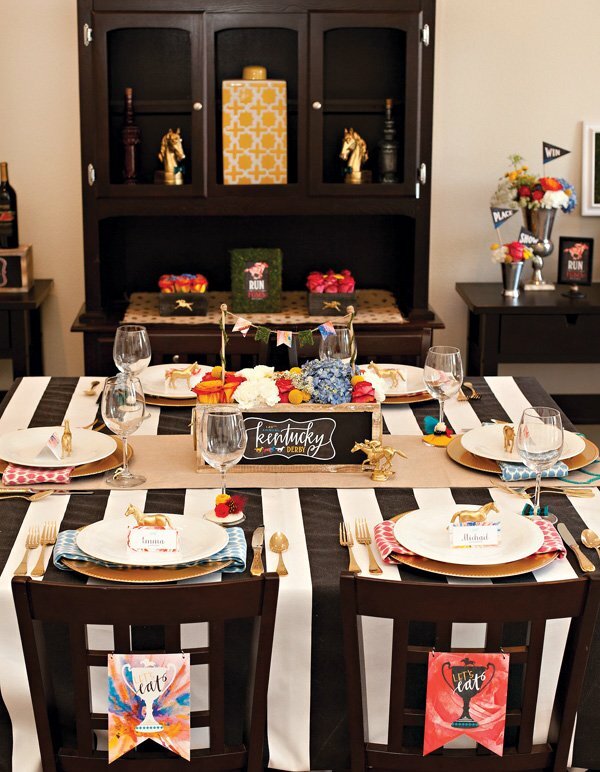 – to bring you lots of creative inspiration for celebrating the Derby in style at home. 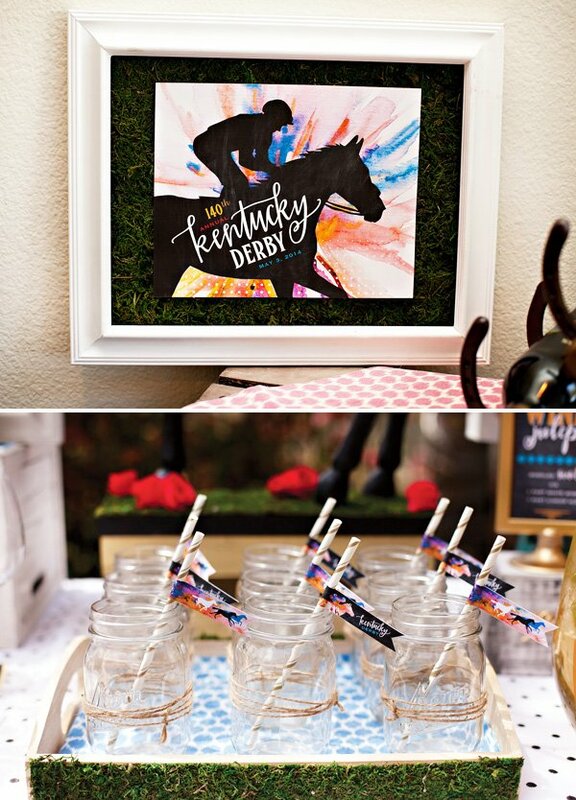 First there was the vintage-modern style Taste of Derby theme, followed by last year’s Preppy Paddock Party. 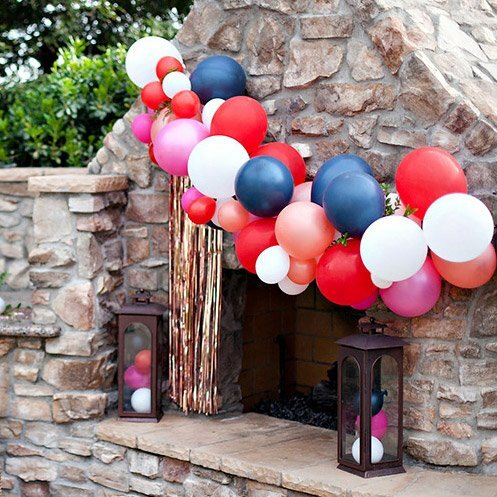 This year, I wanted to come up with something really colorful, fresh, and a bit unexpected, which always makes things more fun for the party guests! 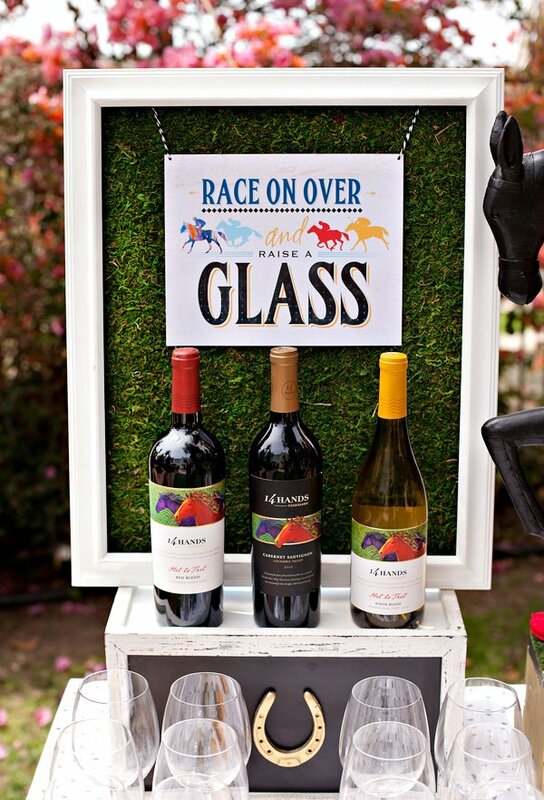 Inspired by the artistic look of the 14 Hands wine bottles and the vibrant colors of jockey racing silks, I mixed in greenery and rustic elements as a nod to the outdoor nature of the race, plus some preppy black and white patterns for a hint of classic Derby style. 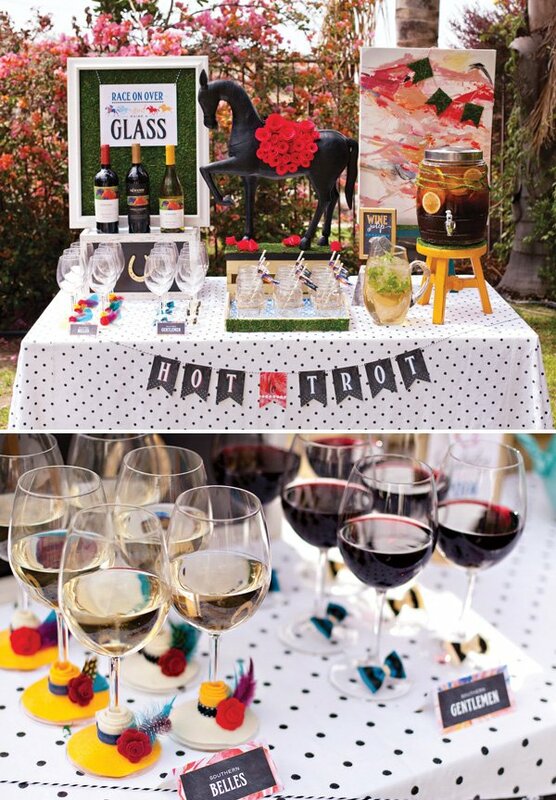 Also, since I’ve partnered with 14 Hands on this project, of course there is a focus on wine and creative ways to serve it – which comes pretty naturally for me since wine is a big part of most celebrations in my group of friends! The connection between 14 Hands and the Derby feels like such a natural fit as well… in addition to being inspired by the unbridled spirit of the wild horses that once roamed Washington State (as rendered artistically on the 14 Hands bottles), their brand new winery is even located in “Horse Heaven Hills”. 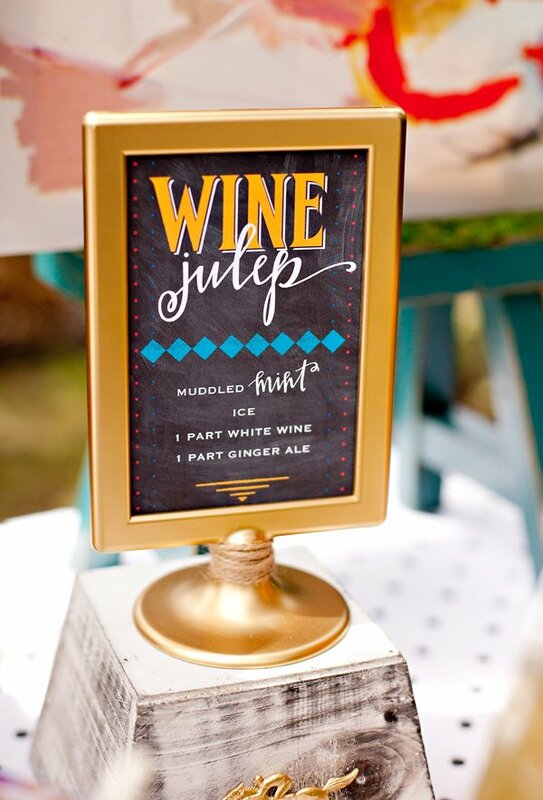 It’s also fun to be able to tell your party guests that they’re enjoying the exact same wine being served to the guests at Churchill Downs – and makes the party feel even more authentic! I wanted the table centerpiece to be festive, unique and approachable. A rustic container was filled with a colorful mix of flowers, then topped with a mini bunting garland fashioned from preserved sheet moss and patterned paper. The container was embellished with hand-cut printable silhouettes on the long sides, and iron horseshoes (spray painted gold) on the short sides. Add raffia to bold striped farfalle pasta to create clever — and super EASY — bow-tie drink markers and decorative accents. 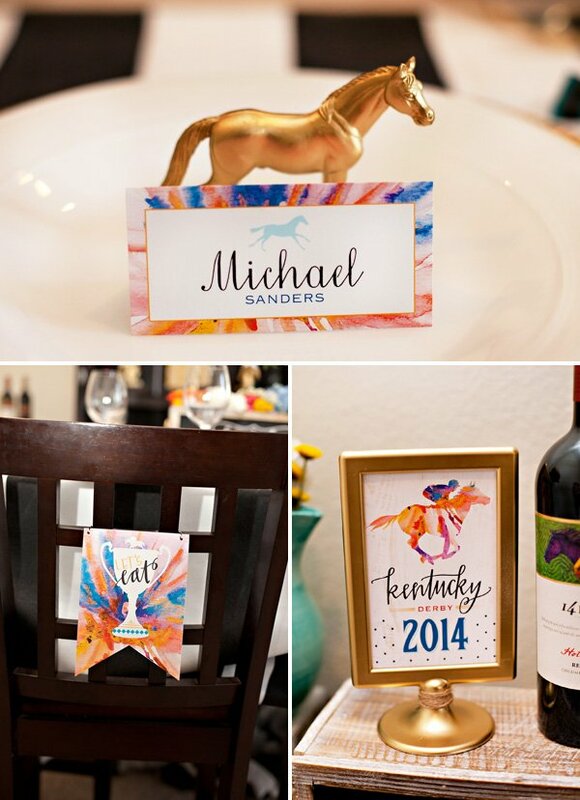 Inexpensive toy horses and 5” horse and jockey figures were given a quick coat of gold spray paint, then used to dress up the table place settings and centerpiece. As a side note — the 5” horse and jockey figures arrived as a shiny yellow gold, but I sprayed them with a softer matte metallic shade of gold to make them look more upscale. I also painted some 2.5” plastic horse and jockey figures gold, removed the bases with a wire cutter, and used them as golden “emblems” on some of the vases and floral containers. 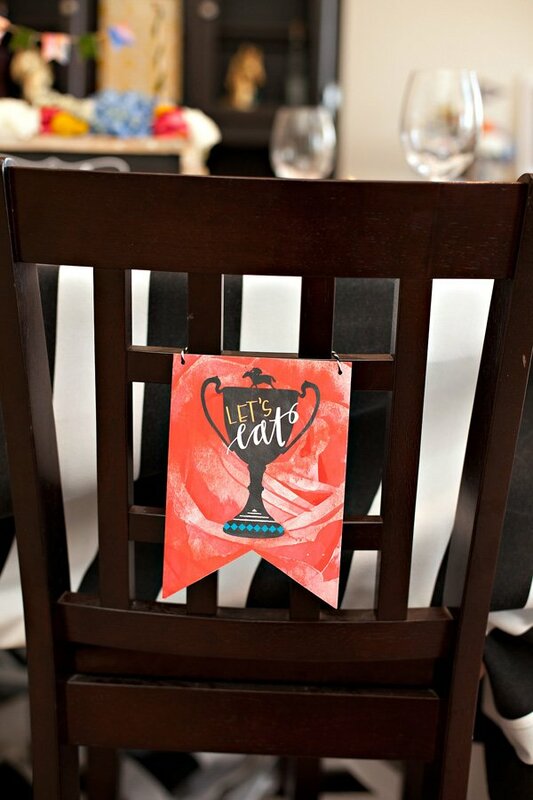 Silver trophy and julep cup vases were filled with colorful flowers and accented with printable Win, Place, Show flags — an easy way to transform any centerpiece into a Derby theme! We cut foam core to fit in open wood frames, covered it with sheet moss and used it as backer for the printable 8×10 signs. Unfinished wooden 4×6 frames ($1 each at Michaels) were also covered in moss and used to display the printable “Run for the Roses” signs. 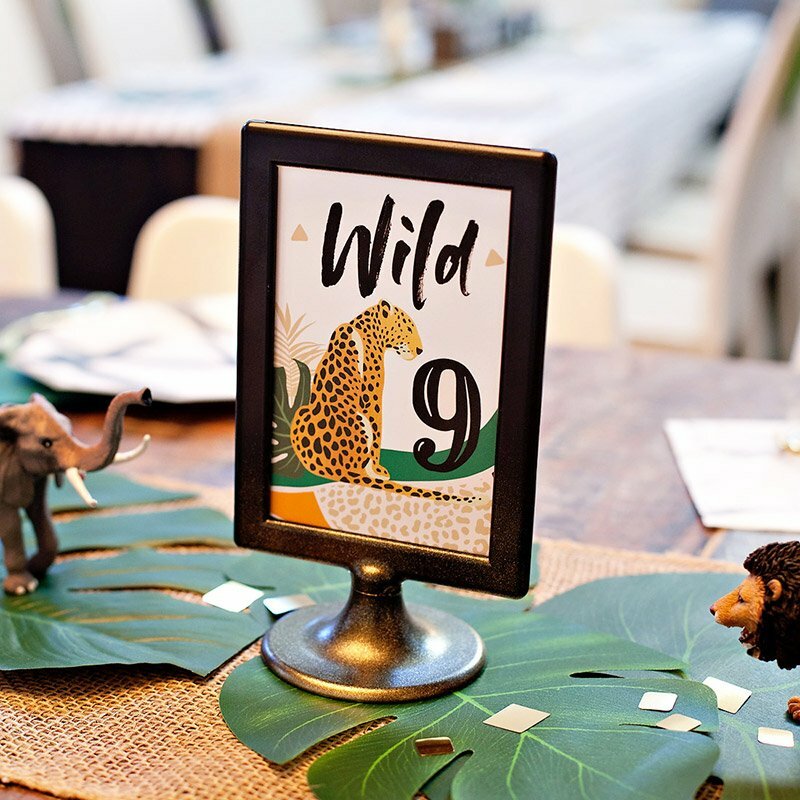 A rustic wooden crate was embellished with wooden craft numbers that were spray painted gold. 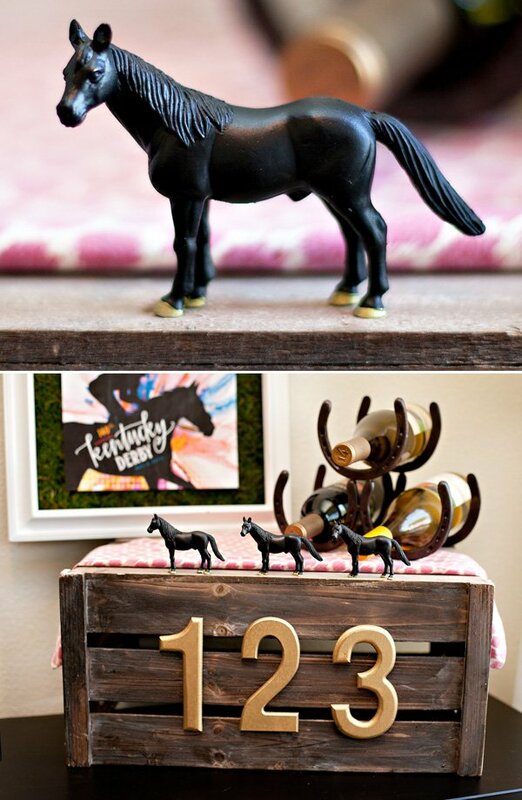 Three toy horse figures covered in chalkboard paint stood above the numbers to represent the Win, Place, and Show horses. We needed to make a lot of paper roses for decor, so choosing an easy-to-accomplish style of paper flower was key. I’ve made paper roses before using standard card stock, but the simple change of bringing them to life with textured crepe paper this time made a world of difference! 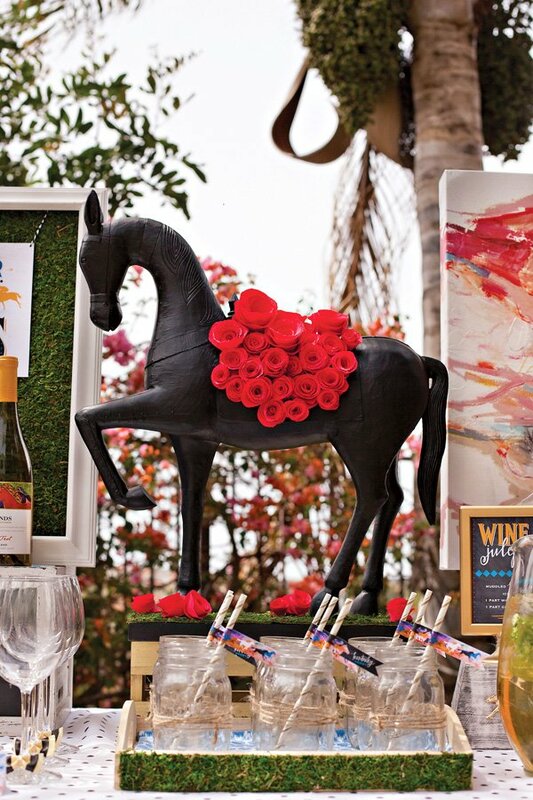 The Garland of Roses is a significant element of the Kentucky Derby®, and I really wanted to create something to represent it well in the party decor. On a decor-scouting trip to HomeGoods, I stumbled on a fantastic wooden horse statue that was just begging to get all dressed up for the party. 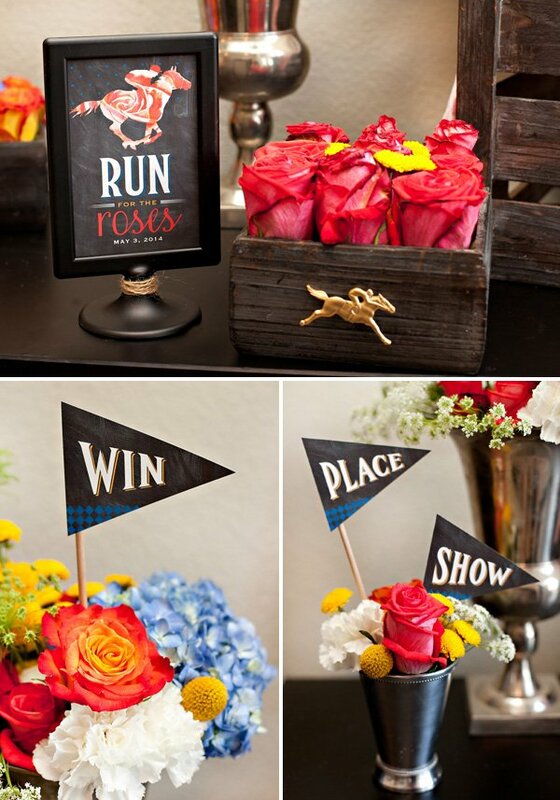 ;) A couple coats of black chalkboard spray paint + lots of red crepe paper roses (secured with glue dots) and voila! I am so happy with how this piece turned out — it definitely makes a statement and feels artistic, but is also surprisingly approachable. This general idea can definitely be recreated in a variety of ways, using different styles and sizes of horse figures, from toys and statues to wire topiary horse forms. Big hats are another important element of the Derby and a great place to utilize paper flowers! Here, a simple & inexpensive wide-brimmed hat was given a big dose of Derby style with just a few DIY paper roses and colorful feathers. Added bonus of decorating your own hat: you can make it perfectly match your party — or your outfit, of course! 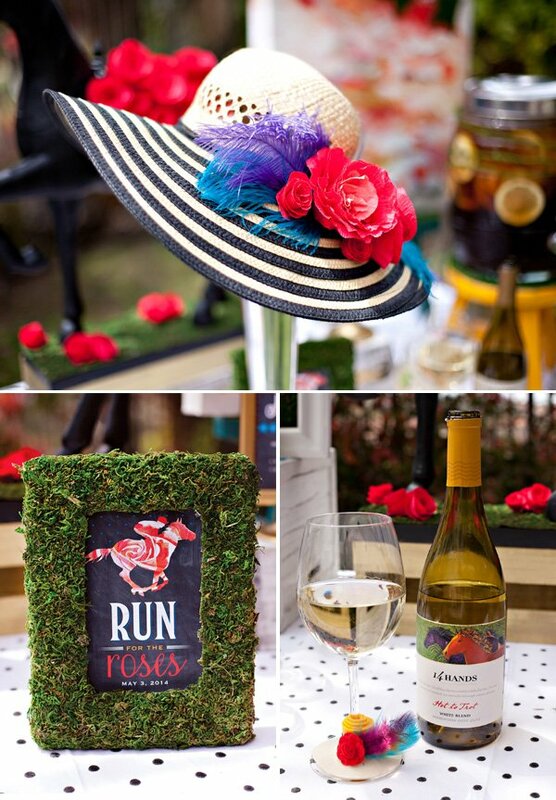 Rolled preserved sheet moss was used to add a “garden party” vibe to many elements in the decor, from embellishing display stands and serving trays to creating mossy bunting banners. Wired moss was also used to decorate the glass drink dispenser. 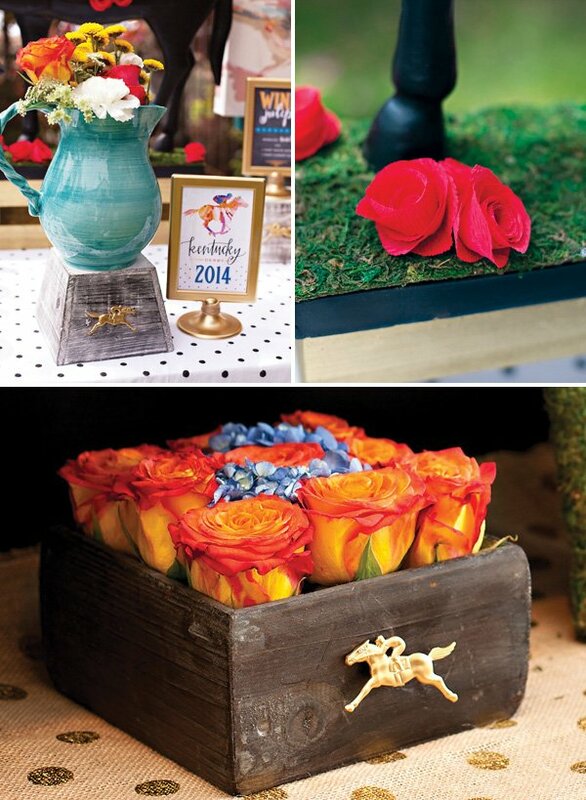 I designed a new Kentucky Derby® Garden Party paper collection to help bring this theme to life and tie all of the elements together. 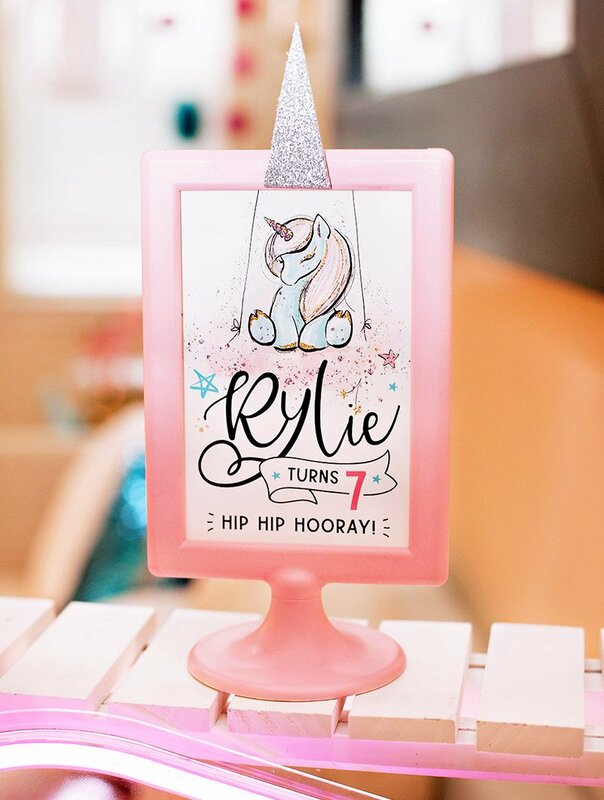 Everything from drink flags and patterned paper to decorative wraps and party signs is included. You can check it out in detail – and download it all for free – right here. Just print, cut, and enjoy! 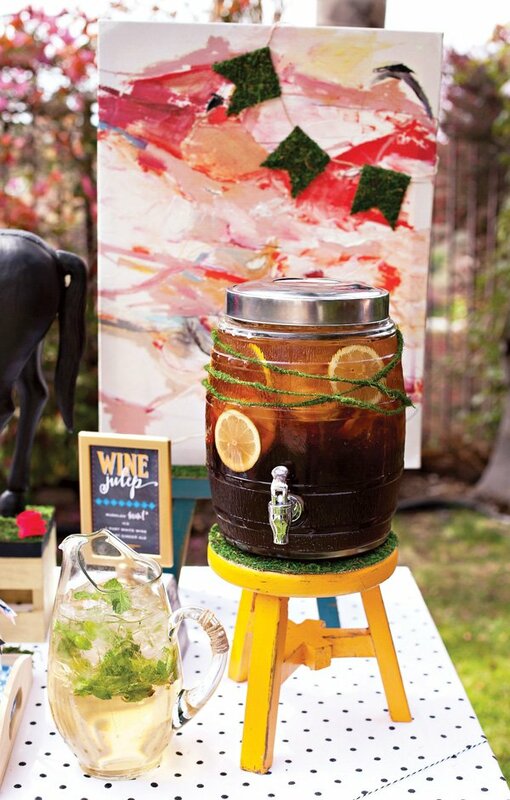 Southern Sweet Tea is a great non-alcoholic option for Derby parties. We garnished ours with a generous helping of lemon wheels and served it from a barrel-shaped glass drink dispenser for some rustic appeal. 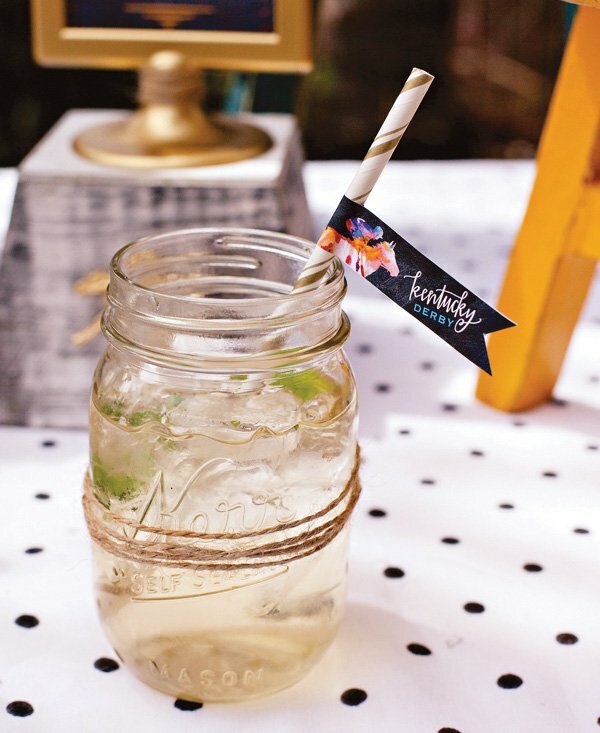 Mason jars were also embellished with twine and provided as drink glasses for the Wine Julep cocktail and Sweet Tea. When it comes to Derby party food, you can do anything from a sit-down meal to small bites. 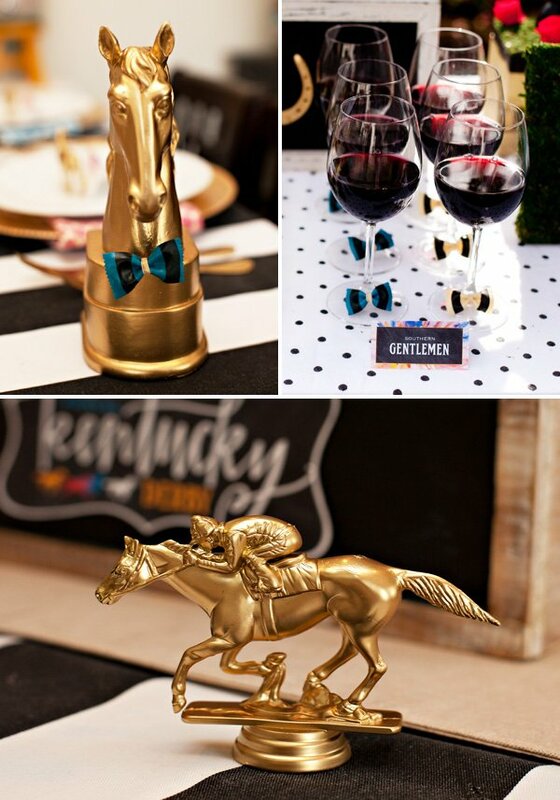 Since there are already so many great Kentucky Derby® inspired recipes and images out there (we featured several of them in last year’s post), I decided to just focus on a couple easy recipes that coordinated well with the look and feel of this new theme. 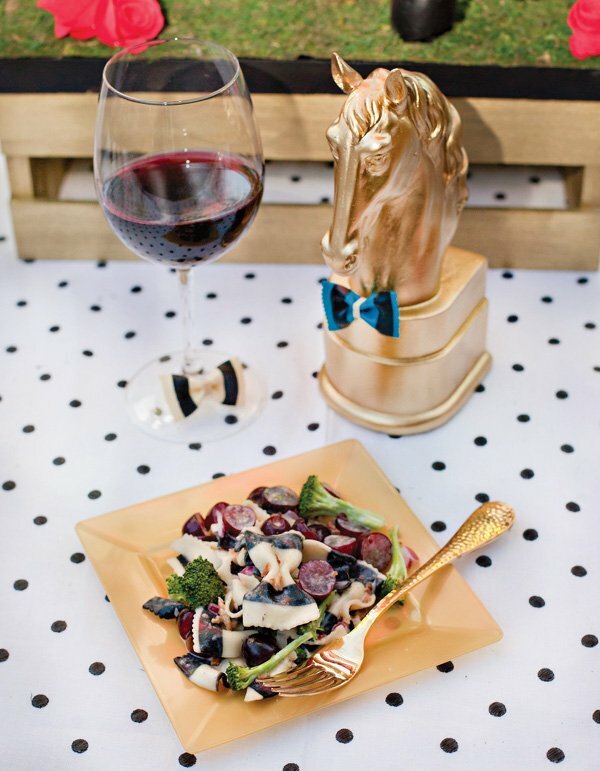 The first recipe is a Southern pasta salad that features the same bold striped farfalle used on the wine glasses and decor. I just couldn’t resist the idea of a guest holding a wine glass with a farfalle bow-tie, then noticing the same striped design on their plate (and in some of the party decor)! I just love surprising guests with clever tie-ins like that at parties. My husband also made some Sweet & Spicy Bourbon Pecans to use in the salad, and I’ll be sharing the recipes for both in a separate post next week, so stay tuned! 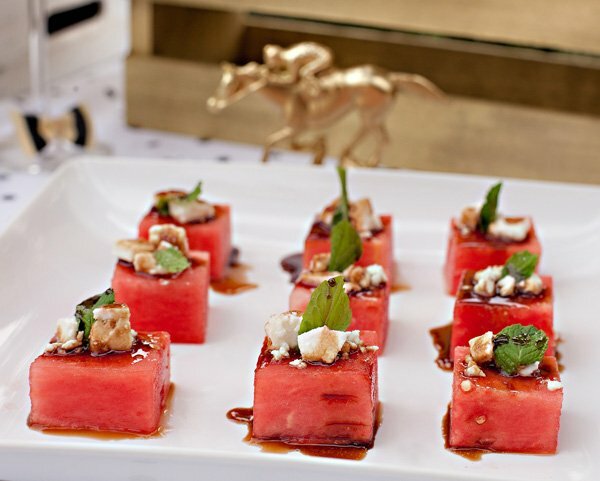 The second recipe we shot was Watermelon-Feta-Mint Salad Bites drizzled with balsamic glaze. 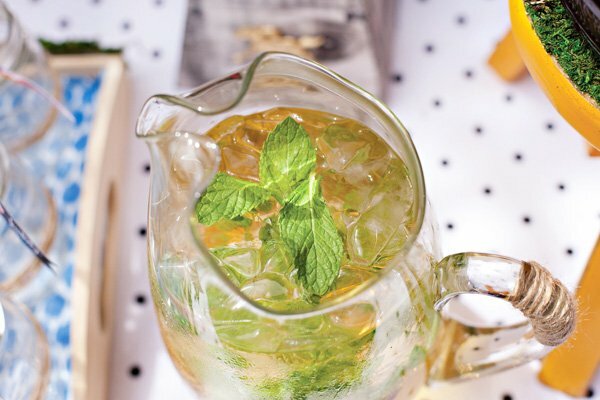 These are super easy to make and the description pretty much says it all when it comes to the recipe, but I felt like this idea was especially fitting here because of the colors (watermelon for red roses) and the use of mint as a tie-in with the Mint Julep. I think this is my favorite party that you’ve done. 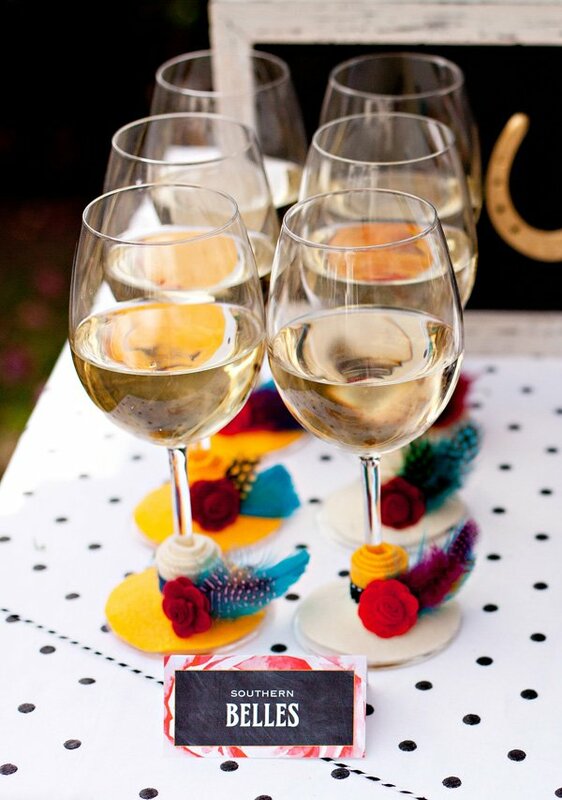 The hats and bow ties on the glass stems are genius! Stunning as always, Jenn! Love the fonts you used and the gorgeous color scheme. 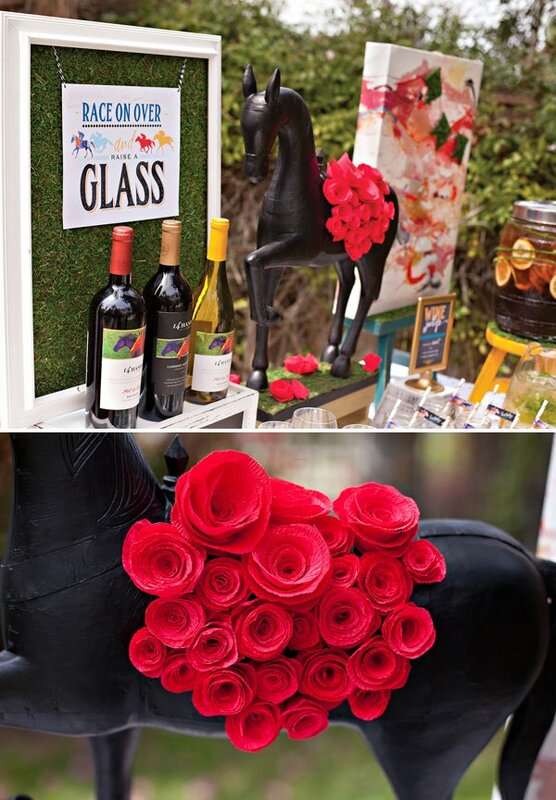 The red flowers on the horse centerpiece are lovely! I am in LOVE with this entire party!!!!! I don't know if I wish I was throwing it or attending it! It's amaze-balls! 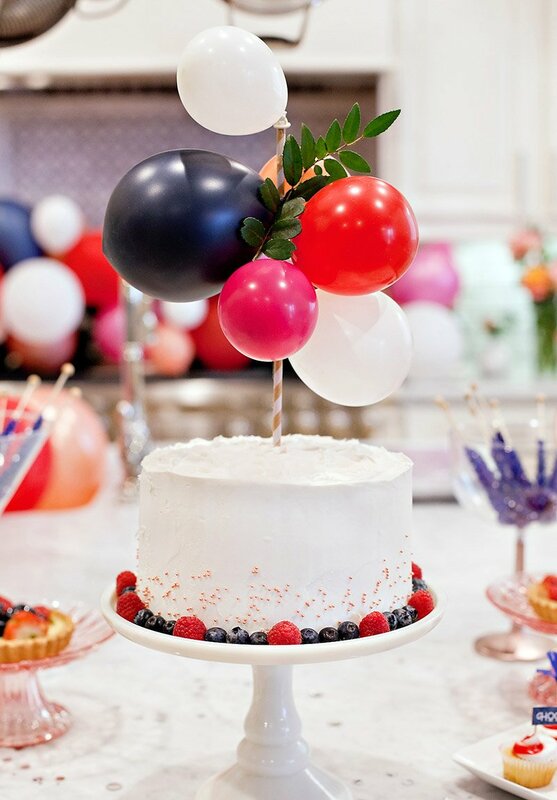 I host a party every year for this and LOVE all your printables. Thank you so much for sharing them! Wow…I LOVE everything about your party!! I wish I would have seen this sooner. I do lifestyle and design segments for a TV show here in Roanoke…so many great ideas!! Glad to find your page. This is the MOST AMAZING find….Thank you so much!!! 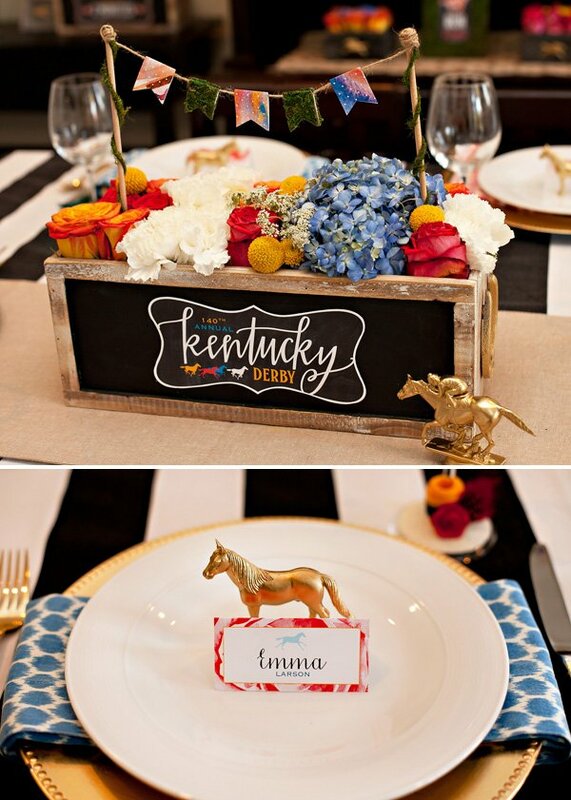 My daughter loves horses so much that I told her we should do her Sweet 16 Kentucky Derby theme. Even better, the first Ever Kentucky Derby started on May 17 which is her birthday. I know we still have 3 years to go……but so excited to plan. 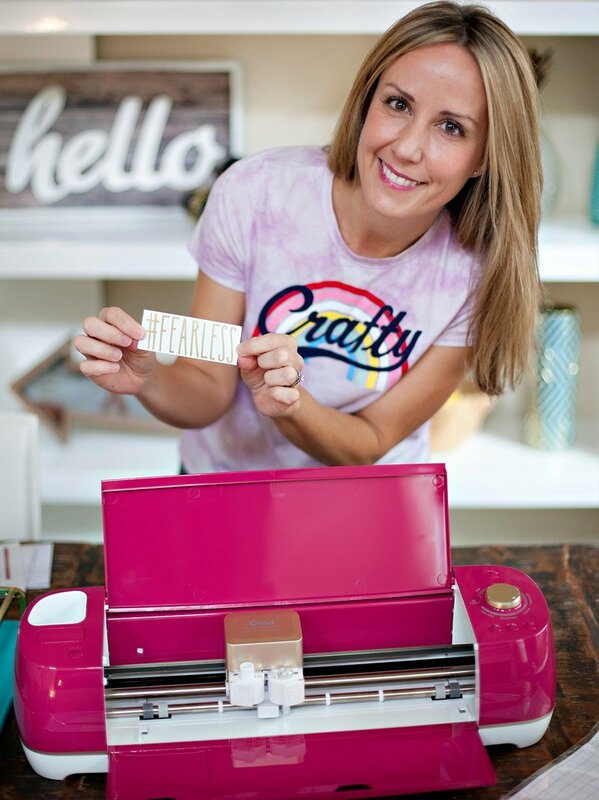 Will you have 2015 printables? Yes :) We’ll have a brand new collection next month, and are also planning to update these to 2015 as well (by the end of March). Stay tuned! I absolutely love these! 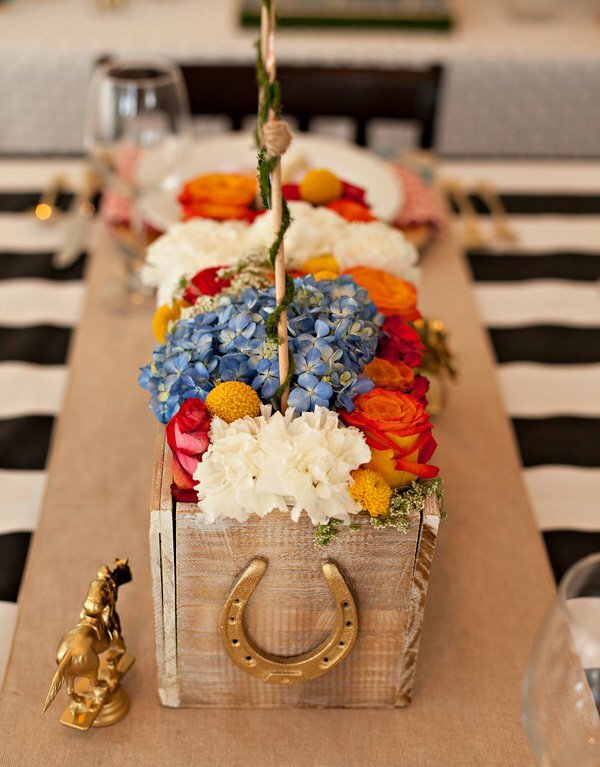 I am greatly inspired by them for my Derby event. Do you happen to know the font used for the word Kentucky? I am looking to buy the digital papers that were used for this but can’t find them anywhere. Does anyone know where to find them? I also would like to make the little banner on the flower boxes but there is no download template for that either.